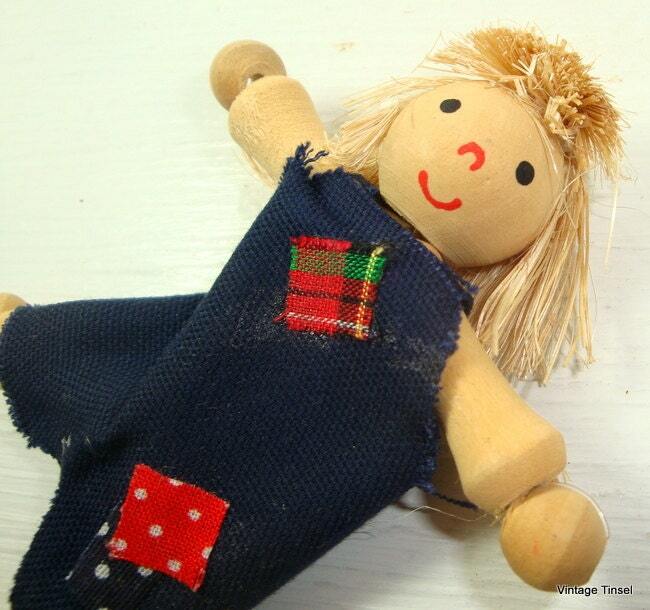 Vintage wood doll to use in your next crafting project. Perfect for a wreath or garland. Measures 3 1/2" tall. Some glue spots showing on clothing. Return to AntiquesGaloreGal for more shopping. I will gladly combine your orders to save on shipping costs and I do ship worldwide. Thanks for looking! Thanks so much for reserving! Awesome seller! Sales tax is applied to all orders from Missouri. For items that are placed on RESERVE, I will hold these items for you for 24 hours, unless other arrangements have been made and approved. After 24 hours, the item will be removed from reserve and placed back into the shop. Questions? Please feel free to ask. I want happy customers! If unhappy with a purchase, please notify me within 24 hours of receiving it. A refund will gladly be given minus shipping costs upon return of item in original condition. I would appreciate the opportunity to make things right before you leave a neutral or negative feedback. Shipping is by USPS. I do go green and ship with recycled boxes and packaging whenever possible! I usually ship 1-3 business days once order has been received. I welcome international orders! If your location is not listed, please convo for accurate shipping charges. International orders can be very difficult to calculate if more than one item is ordered. I will refund any excessive overcharges. PLEASE BE AWARE OF THE CUSTOM REQUIREMENTS FOR YOUR COUNTRY!! I CANNOT BE RESPONSIBLE FOR ITEMS THAT CUSTOMS WILL NOT ALLOW!! CUSTOM FEES, VATS, DUTY, TAXES OR OTHER COSTS DUE FOR INTERNATIONAL ORDERS ARE THE RESPONSIBILITY OF THE CUSTOMER! THESE FEES ARE IMPOSED BY THE RECEIVING COUNTRY AND NOT INCLUDED IN THE SHIPPING COST. ALL INTERNATIONAL ORDERS ARE SHIPPED FIRST CLASS INTERNATIONAL MAIL. I WILL NOT DECLARE A PURCHASE AS A GIFT TO AVOID CUSTOM FEES. THIS IS A FEDERAL OFFENSE AND CARRIES SEVERE PENALTIES. Depending upon your country, it is possible that your order may be held at your local post office for pick up rather than delivered straight to your door. Sometimes this is done because the recipient is not home when the delivery attempt was made, or when customs fees are due. Typically, the postal service will leave a notice that delivery was attempted. It is strongly encouraged for buyers to monitor the progress of their order using the tracking information provided. Parcels that have not been collected will eventually be returned to the sender. If that is the case, once I receive the order back in its original condition, I will contact you to determine how you would like to proceed. If you wish for me to resend the package it will be necessary for you to pay a second shipping fee. Alternatively, we can cancel the transaction and issue a refund for the full purchase price - minus the original shipping costs. ***Please note that these items are vintage and probably will show some wear and tear. Every effort is made to describe the item in detail. Read the description carefully and view the photos provided. ***I photograph indoors and use a flash and daylight bulbs. I do not alter or enhance my photographs, however, different computers may show slightly different colors. ***Because this items are vintage, I cannot guarantee they have not come from a smoker or pet owners home. ***Please feel free to contact me with any questions that you might have prior to placing your order. Your perception of vintage and mine may not be the same! I want you to love your purchase and understand what you are receiving.